As I looked through the Gitche Gumee Museum’s archives, I came across an article about sand dunes, titled” Dunes: As fragile as the shifting sands, we all need to protect this unique resource.” It was published Michigan Natural Resources magazine in May/June 1979. As much as I love the Lake Superior beach, I must admit … Continue reading "History Gem – Sand Dunes: A Fragile Ecosystem"
Background Information Four years after the Niemies retired the Shark, she was sold to a fisherman in Cheboygan who was determined to catch sturgeon in Lake Huron. After two years with no success, he sold the tug to a pleasure boater in southwestern Michigan. Its ownership was transferred a couple of more times before it was … Continue reading "History Gem – 1995 Grand Rapids Press Article about the Fish Tug, Shark"
April 2018 History Gem – 1932 Petition submitted by the Grand Marais Womens’ Club to the Burt Township Board After the railroad closed in 1910, the population in Grand Marais declined from thousands of people down to just a few hundred. Since there were no roads yet, the only way to get to Grand Marais … Continue reading "History’s Gem of the Month: 1932 Petition"
December 2017 This morning I went through some of the Gitche Gumee Museum’s archives and came across a newspaper article about the island that used to be on the outside edge of Grand Marais Bay. The island had different names including Seagull Island, Gull Island, and Lost Island. In the late 1960s my sister and … Continue reading "History’s Gem of the Month: Article about Seagull (Lost) Island, Grand Marais Bay"
July 2017 When I researched the history book I wrote two years ago, Superior Land and the Story of Grand Marais, Michigan, one of my tasks was to search through the museum archive and other resources. I have a fourth cousin in Finland (Rauno Sarja) with whom I have been corresponding for several years. Rane … Continue reading "History’s Gem of the Month: Jonas Hill Letters"
March 2017 When I researched the history book I wrote last year, Superior Land and the Story of Grand Marais, Michigan, one of my tasks was to locate relevant photos. Thankfully, the museum archives contained many dozens of film negatives and pictures. I also acquired some photos from the State Historical Library in Lansing. Finally, I … Continue reading "History’s Gem of the Month: Logging Era Photos"
June 2016 While searching through my archives to look for something to include as a “history gem,” I came across these three poems about Grand Marais. Grand Marais by Esther Miller On the shores of Lake Superior, lies a special little town. Inhabitants are very few, but to me of great renown. It brings back … Continue reading "History’s Gem of the Month: Grand Marais Poems"
November 2015 I have hundreds of documents in the museum’s archives, all saved by the museum founder (Axel Niemi) and his family. One of the items I have is a copy of The Alger Echo, a newspaper published by James Carter. The following article was included in the Fall 1969 issue, Vol I, No 9. … Continue reading "History’s Gem of the Month: Gitchee Agomowin"
June 2015 This past winter one of my projects was to dive into a closet that has not seen the light of day for 17 years. The closed contained Grand Marais historical items. Back in 1998 I had gone through all the artifacts and organized them into categories. Some of the items were not conducive … Continue reading "History’s Gem of the Month: Vintage Grand Marais Photos"
February 2015 NOTE: I found this newspaper article in the Gitche Gumee Museum’s archive. At the beginning of the article, it states that this is number 27 in a series of touring articles dealing with the Dunes of Michigan. Four score years ago Henry Wadsworth Longfellow gave to the reading world his rhythmic “Hiawatha,” epic … Continue reading "History’s Gem of the Month: Michigan’s Mystic Dunes;Where Wily Paw-Puk-Keewis DancedBy Arthur W. Stace Date and source unknown"
September 2014 NOTE: Last May I purchased a small rock collection from a woman in Gwinn, MI. The collection belonged to her husband, who passed away a decade ago. This information sheet was included in the collection. The source is unknown. OUR GREAT LAKES SHORELINES ARE TREASURE-LADEN WITH A HOST OF TRULY fascinating gem materials—not … Continue reading "History’s Gem of the Month: Michigan Beach Stones By Robert W. Kelley"
April 2014 Thanks to my friend, Jill Phillips, I was able to borrow a souvenir book published during the 1930s by Photogeletins Engraving Co., Toronto, Canada. It is one of the Dominion Series books that this company published. The Soo Locks (pronounced “soo”) are a set of shipping locks arranged parallel to each other. These … Continue reading "History’s Gem of the Month: Souvenir View Book of Sault Ste. Marie"
November 2013 A few years ago, former Grand Marais resident (but current property owner) James Carter borrowed a copy of an old Grand Marais newspaper that is in the Gitche Gumee Museum’s archive. I was curious why he even knew about it. I loaned him the paper, along with a few other items. When he … Continue reading "History’s Gem of the Month: Excerpts from The Grand Marais Herald"
History’s Gem of the Month: All That Glitters…. August 2013 ‘All That Glitters….’ By Harry C. Sahs August 31, 1958 The Detroit News Pictorial Magazine If agates were gold nuggets, Axel A. Niemi would be the richest man in Michigan. 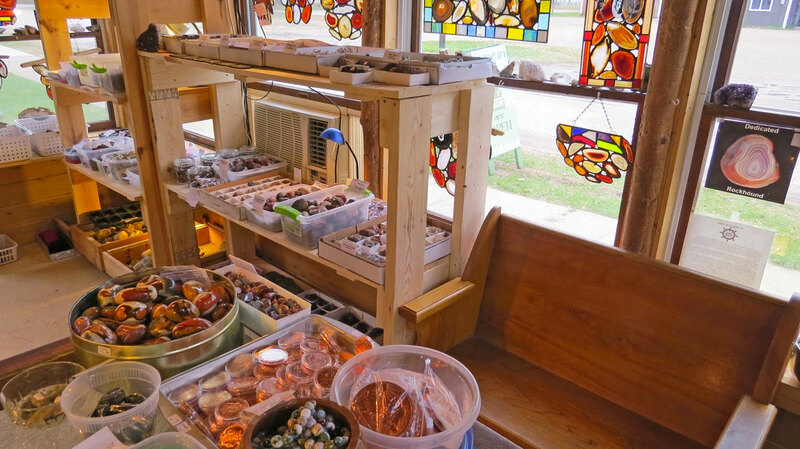 Of all the “rock hounds” who have combed the storm-tossed beaches of Lake Superior for agates, probably none has found as many of … Continue reading "History’s Gem of the Month: All That Glitters…." March 2013 This is the second History’s Gem of the Month posting featuring a thesis written in 1995 by Jim Williams for a class at Western Michigan University. The curator of the Michigan Maritime Museum gave me a copy of the thesis when the museum also gifted me with the Shark. The thesis is several … Continue reading "History’s Gem of the Month: The Shark: Post 3"
September 2012 This is the second History’s Gem of the Month posting featuring a thesis written in 1995 by Jim Williams for a class at Western Michigan University. The curator of the Michigan Maritime Museum gave me a copy of the thesis when the museum also gifted me with the Shark. The thesis is several pages long, so … Continue reading "History’s Gem of the Month: The Shark: Post 2"
June 2012 I was looking through the museum archive to look for something to post in this update’s History’s Gem of the Month when I came across a copy of a master’s thesis written in 1995 by Jim Williams for a class at Western Michigan University. The curator of the Michigan Maritime Museum gave me … Continue reading "History’s Gem of the Month: The Shark: Post 1"
March 2012 I wish I had a picture of John Keating. I do not. He was quite a colorful character that owned the Keating Knitting Factory in Grand Marais, MI at the turn of last century. He was born in Ireland on November 10, 1869. When he was 23 years old, he immigrated to the … Continue reading "History’s Gem of the Month: John Keating"
Winter 2011 When I was visiting my friends in Marquette, Jim and Helen Riley, Helen donated a couple of old Grand Marais pictures. These were given to her by her namesake aunt, Helen Olli, who is 91 years old. The first is a picture that she thought was the Wabash Hotel. I researched the photo … Continue reading "History’s Gem of the Month: Old Postcards and Pictures"
September 2011 The historical information included in this web page update has been taken from two sources. The subject involves the log marks used by lumber companies during the logging boom. The Michigan State College (now Michigan State University) published a pamphlet in January 1942 entitled Michigan Log Marks. (Memoir Bulletin No. 4, edited by … Continue reading "History’s Gem of the Month: Michigan Log Marks"
Fall 2010 The following text was found in the Gitche Gumee Museum’s archive. There is a note attached that says it was taken from The Superior Sun (1929), which in turn took it from Geographical Reports of Douglas Houghton, published by the Michigan Historical Commission in 1928, but written in 1874 by Bela Hubbard. “Among the pleasantest … Continue reading "History’s Gem of the Month: Reprint from the Douglas Houghton Expedition"
August/September 2010 1958 Detroit News Article about Axel Niemi When I work on the web page update, the last segment I always do is the History’s Gem of the Month. I have a couple of closets in my house jammed with museum archive materials. It is always fun to pull out a box and look … Continue reading "History’s Gem of the Month: 1958 Detroit News Article about Axel Niemi"
July 2010 Shipwrecks at Agate Beach In the museum’s archive I found the photo included below. It shows ships that went aground between Agate Beach and the breakwater that protects Grand Marais Bay. On the back of the photograph, the following description was written: On October 20, 1905 at nightfall the second mate of the … Continue reading "History’s Gem of the Month: Shipwrecks at Agate Beach"
June 2010 Reprinted from recoilmag.com, July 2005 issue Pinconning, Mich. — A historic collegiate achievement was realized Friday when a medium-sized cardboard box containing a half-dozen rocks received a Bachelors Degree of Science in Business and Marketing from University of Phoenix Online, a popular online college. “Congratulations! You’ve graduated!” the box of rocks was informed … Continue reading "History’s Gem of the Month: Box of Rocks Gets Diploma"
April/May 2010 Continued from March 2010, Part 2 Commercial fishing had by now reached its peak. In 1904, a record catch of 12,000 pounds of fish was brought in by the “William E.” of the Buckeye Fish Company. The supply of fish seemed inexhaustible. The blueberry industry was important as a source of revenue for … Continue reading "History’s Gem of the Month: The Story of Grand Marais, Part 3"
March 2010 Continued from February 2010, Part 1 The city had many fine civic clubs and organizations. Among these were the Kenningston Club and the Grand Marais Club. A fine opera house was built and it was frequented by many famous actors of the day. The Grand Marais Cornet Band was a favorite not only … Continue reading "History’s Gem of the Month: The Story of Grand Marais, Part 2"
February 2010 Reprinted with permission from J. Carter. While my friend, Renee Beaver-Stocking, was cleaning out a closet in a home that she is house sitting for this winter, she came across this high school paper written by James Carter in 1953. He later went on to not only own a newspaper in town, but … Continue reading "History’s Gem of the Month: The Story of Grand Marais, Part 1"
September 2009 While looking through the museum’s archives, I found this article drafted by the museum founder, Axel Niemi. I’m not sure if he ever published the article, but it is worthy of inclusion as this month’s history gem. I’ve also added a few pointers, so actually this is a joint article written by Axel … Continue reading "History’s Gem of the Month: Hints on Hunting and Finding Agates"
August 2009 During the late 1800s and early 1900s, ship travel on Lake Superior was at its heyday. To help rescue ships that suffered the wrath of Lake Superior’s storms, the United States Lifesaving Service operated five stations along the southeastern section of the lake’s shoreline. Due to all the accidents, this section is often … Continue reading "History’s Gem of the Month: Ship Travel on Lake Superior"
July 2009 When I dismantled the display of Axel’s Numbered Agates, I also took down some of the memorabilia that was above the rock shelves. Below is a photo taken by W.H. Hadley of Royal Oak, MI. It shows the original museum sometime around the late 1960s. Notice that there is a large tree to … Continue reading "History’s Gem of the Month: History of M77"
Spring 2009 Although people started living full time in Grand Marais in the mid 1800s, the town really didn’t grow until 1893 when the railroad was extended from Adam’s Trail north to town. Within a few short years, Grand Marais was a thriving community with a couple thousand residents, as well as other transient workers … Continue reading "History’s Gem of the Month: History of M77"
March 2009 Several years ago, museum visitors Frank and Karen Miller sent me this poem, which was written by their mother, Ruth Finch Franklin. Given that we are all itching to hit the beach to look for the elusive agate, I thought that the reprinting of this poem may inspire our spring rockhounding. May the … Continue reading "History’s Gem of the Month: Lake Superior Agate Poem"
February 2009 While searching through my archives, I came across this article published in the Detroit Free Press on Friday, February 12, 1988. Given that we have an old fashioned winter this year, I feel that it is appropriate to include the reprint this month. Snowstorm is kid stuff, UP folks say – Downstate troubles … Continue reading "History’s Gem of the Month: Snowstorm Article from 1988"
Fall 2009 While I was looking for something to include for this month’s history gem, I ran across yet another article written by Axel, which is different than the one that I included last month. This one is a rough draft, and required editing. Hints on Hunting and Finding Agates By Axel Niemi and Karen … Continue reading "History’s Gem of the Month: Hints on Hunting and Finding Agates – PART II"
January 2009 This month the Gems from the Past include three post cards. I am not sure how and why it occurred, but 100 years ago post cards were often printed showing members of local families. I have included two below of my relatives. My great-grandparents, Jonas and Anna Hill, appear in both pictures. The … Continue reading "History’s Gem of the Month: Old Postcards"
December 2008 While conducting research last week at U of M’s library in Ann Arbor, I was very excited about all the agate genesis articles I was able to locate. I concentrated mostly on articles published in the last decade. However, I could not resist the temptation to print off a 66-page leaflet published by … Continue reading "History’s Gem of the Month: Agate Leaflet from 1927"
November 2008 Probable Economic Impact of the Lakeshore The most direct economic impact of the proposed lakeshore will be upon the forestry and recreation industries of the Upper Peninsula region. These industries and associated economic opportunities are examined here. Forestry Forest industries are the largest single source of employment in the Upper Peninsula region. In … Continue reading "History’s Gem of the Month: Pictured Rocks National Lakeshore Proposal Part 5"
October 2008 Access and Circulation A scenic road would make accessible much of the now remote shoreline and permit visitors to tour the entire length of the park. In places, this road would run along the rim of the uplands overlooking the important natural and scenic areas, leaving them road-free yet visible. Associated trails would … Continue reading "History’s Gem of the Month: Pictured Rocks National Lakeshore Proposal Proposal Part 4"
Summer 2008 (continued from the June & Summer 2008 update) THE LAKESHORE PROPOSAL As proposed, the national lakeshore would comprise an area about 35 miles long and 3 miles wide. It would contain approximately 67,000 acres, exclusive of any water area of Lake Superior. (The water boundary lies one-quarter mile offshore.) The proposal is divided … Continue reading "History’s Gem of the Month: Pictured Rocks National Lakeshore Proposal Proposal Part 3"
Summer 2008 (continued from the June 2008 update) Plant Life Forests of Michigan’s Upper Peninsula are a transition between northern hardwoods and northern conifers. In some locations the primary stands are deciduous trees with an occasional mixture of pine and hemlock; elsewhere the steeple-topped spruce and fir predominate. In the northern hardwood-conifer type forests, extensive … Continue reading "History’s Gem of the Month: Pictured Rocks National Lakeshore Proposal Proposal Part 2"
June 2008 While combing through the museum’s archives, I recently came across the original proposal for creating the Pictured Rocks National Lakeshore, which was established by legislation passed in 1966. Grand Marais is the eastern entrance to the national park. I will relay interesting information from the report beginning this month, and continuing in the … Continue reading "History’s Gem of the Month: Pictured Rocks National Lakeshore Proposal Proposal Proposal Part 1"
The Gem of the Month for May includes two old postcards I found among my mother’s things. The first is a picture of Sable Lake taken from the bluff of the dunes. The photo was taken by John Penrod of the Penrod/Hiawatha Company out of Berrien Center, MI. On the back there is the following … Continue reading "History’s Gem of the Month: Old Postcards"
April 2008 The following newspaper clipping was found among my mother’s keepsakes. For those of you who have been to Grand Marais and noticed the wood tiled ceilings in various homes and businesses (including the Lake Superior Brewing Company), these tiles were made at the factory owned by Harry Habbershaw. The cedar stump constructed by … Continue reading "History’s Gem of the Month: Cedar Stump article from 1962"
March 2008 While in the Sarasota, Florida area in March, one of the places we visited was the Crowley Museum. I must admit that the $7.00 admission per person a little steep for what the museum had to offer, but there were some interesting items. One of my favorite items was a list of the … Continue reading "History’s Gem of the Month: 1915 Rules for Teachers"
February 2008 Unusual Wedding Invitation I have seen a copy of Axel’s wedding invitation before. In fact, I have one on display at the museum that Axel mounted onto a board. However, when I looked through some of my mother’s things, I came across the copy that was sent to my grandparents, Mr. and Mrs. … Continue reading "History’s Gem of the Month: Unusual Wedding Invitation"
January 2008 For those of you who lived in or visited Grand Marais during the 1960s, you probably remember the signs that were displayed on the pole outside of the Dunes Saloon, now called the Lake Superior Brewing Company. The founder of the museum Axel Niemi, was actually one of the movers and shakers that … Continue reading "History’s Gem of the Month: Grand Marais Tourist Signpost"
December 2007 This month’s History Gem continues with the Lake Superior information theme. Recently, I received an email from David J. Krause, a geology professor from Ann Arbor, MI. He is a UP enthusiast who wrote the book “The Making of a Mining District” about the history of copper mining in Michigan. David’s wife is … Continue reading "History’s Gem of the Month: Lake Superior Editorial"
Fall 2007 Last year, a couple of boxes of Grand Marais memorabilia were donated to the museum from the John Strom family. Included were several newspaper clippings going back to the 1920s, as well as some old post cards, logging equipment, and other items. The following article, written by Robert Page Lincoln, was published in … Continue reading "History’s Gem of the Month: Tourist Information from the 1920s"
August 2007 This article was contained in the museum’s archive. It was glued onto a page on which the museum founder, Axel Niemi, wrote that it was written in 1957 by Dr. George M Schwartz from the University of Minnesota. The source of publishing was not noted. Origin of Lake Superior Lake Superior, is the … Continue reading "History’s Gem of the Month: Lake Superior Origin from 1957"
July 2007 While looking through the museum’s archives to select this month’s history gem, I came across a draft of an article written by the museum founder, Axel Niemi. I’m not sure if and when he ever published this article, but I thought it worthy of sharing. HINTS ON HUNTING GLACIAL AGATES Grand Marais to … Continue reading "History’s Gem of the Month: Hints on Hunting Glacial Agate Article"
June 2007 This new section, History’s Gems, replaces two sections from the original web site, including Gems from the Past, and Story Corner. It also evolves and expands to include new items. After updating the original web page each month during the first couple of years, it became more and more difficult to separate the … Continue reading "History’s Gem of the Month: The Story of the Grand Marais “Meteor”"
May 2007 This first entry in the new section has been requested by several museum visitors. It recounts one of the many reasons why Axel was a major influence in my life. This is the story about Axel’s telescope, which is now safely stored at my house. THE TELESCOPE My eyesight was extremely poor until … Continue reading "History’s Gem of the Month: The Telescope Story"